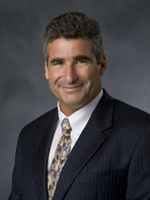 Thomas C. Katsouleas, Ph.D, became dean of Duke University’s Pratt School of Engineering in July 2008. He also serves as professor of electrical and computing engineering. A specialist in the use of plasmas as novel particle accelerators and light sources, Katsouleas previously had served on the faculty of the University of Southern California’s Viterbi School of Engineering since 1991. He joined the USC faculty as an associate professor of electrical engineering and became a full professor in 1997. During his tenure at USC, Katsouleas served in a variety of administrative and academic capacities, including president of the faculty, interim vice provost for information services, and associate dean of student affairs.